The media coverage of the war in Syria examines only military, diplomatic and humanitarian action. It ignores profound transformation. However, one does not survive a sea of violence without changing profoundly. From Damascus, where he has lived for two years, Thierry Meyssan describes this evolution. While in Damascus, the Special Envoy of the Secretaries General of the Arab League and the UN, Lakhdar Brahimi, presented “his” draft peace conference project, Geneva 2. A conference whose objective would be to end the “civil war”. This terminology rehashes the analysis of one side against another, of those who argue that this conflict is a logical continuation of the “Arab Spring” against those who argue that it has been manufactured, fueled and manipulated from the outside. For Westerners and the majority of the National Coalition, Syria is experiencing a revolution. Its people have supposedly risen up against a dictatorship and aspire to live in a democracy like the United States. However, this view is contradicted by the Gulf Cooperation Council, the Syrian National Council and the Free Syrian Army. For them, the problem is not one of freedom, but the personality of Bashar al-Assad. They would be willing to keep the same institutions if the President agreed to step aside for one of his vice-presidents. However, this version is in turn contradicted by the fighters on the ground, for whom the problem is not the personality of the president, but the tolerance that he stands for. Their goal is to establish a Wahhabi system where religious minorities would be subdued or destroyed, and where the Constitution would be replaced by Sharia law. At first, when snipers were killing people, it was said that it was the regime gunmen who were trying to impose fear. When cars exploded, it was said it was a false flag attack by the secret services. When a massive attack killed members of the Security Council, Assad was accused of having eliminated his rivals. Today, nobody doubts that these crimes were the work of jihadists and they continue to commit more. Initially, Syrians did not watch national television channels. They considered these to be propaganda and their preferred source was Al- Jazeera. On live TV, they followed the exploits of the “revolution” and the crimes of the “dictatorship”. But with time, they found themselves confronted directly with events. They saw for themselves the atrocities of the peudo-revolutionaries and they often owed their survival solely to the national army. Today, people watch national television much more, and especially Al- Mayadeen, a Lebanese-Iraqi channel that recovered the audience of Al Jazeera in the Arab world and who is developing an openly nationalist point of view. At first, the armed opposition claimed to be multi-denominational. People from religious minorities supported it. Then came the Islamic Courts sentencing to death and slitting the throats of the “bad” Sunni “traitors” to their community, the Alawites and Shiites, tortured in public, and Christians expelled from their homes. Today everyone understands that one is always a heretic when one is judged by “the pure ones”, the Takfirists. While intellectuals argue that Syria was destroyed and needs to be redefined, people know what it is and are often willing to die for it. Ten years ago, every family had a teenager they were trying to exempt from military service. Only the poor were considering a career in the armed forces. Today, many young people enrol in the army and their elders join the popular militias. They all defend eternal Syria where various religious communities live side by side and they all venerate the same God when they have one. During the conflict, many Syrians themselves evolved. At first they mostly watched events from the sidelines, most declaring not seeing themselves in any camp. After two and a half years of terrible suffering, everyone who remained in the country had to choose to survive. War is but an attempt by the colonial powers to blow on the embers of obscurantism to incinerate civilization. For myself, having known Syria for a decade and having lived in Damascus for two years, I realize how much the country has changed. Ten years ago, each spoke in a low voice of the problems he had encountered with mukhabarats poking their noses into everything and anything. In this country, of which the Golan is occupied by Israel, the Secret Service had indeed acquired extravagant power. Yet they saw and knew nothing of the preparations for war, of the tunnels that were dug and of the weapons that were imported. Today, a large number of corrupt officials have fled abroad, the mukhabarats have refocused on their mission of homeland defense about which only the jihadists have to complain. Ten years ago, the Ba’ath Party was constitutionally leader of the nation. It alone was allowed to field candidates in elections, but it was already no longer a mass party. Institutions were gradually moving away from the citizens. Today, it’s hard to keep track of the birth of political parties as they are so numerous. Anyone can run for office and win. Only the “democratic” opposition from Paris and Istanbul have decided to boycott rather than lose. Ten years ago, one did not talk politics in cafes but only at home and only with people you knew. Today, everyone is talking about politics everywhere in government-controlled areas and never in areas controlled by armed opposition groups. Where is the dictatorship? Where is the democracy ? The war is also a class conflict. 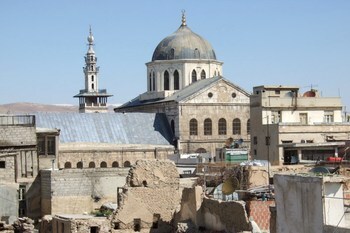 The rich, who have assets abroad, left when Damascus was attacked. They loved their country, but especially wished to protect their lives and property. The bourgeois were terrified. They paid “revolutionary” taxes when insurgents demanded, and asserted state support when the army questioned them. Worried, they awaited the departure of President Assad which [[Al-Jazeera announced as imminent. They only lost their anxiety when the United States abandoned plans to bomb the country. Today, they think only of redeeming themselves by supporting the associations of families of martyrs. The little people knew from the beginning where things were at. There were those who saw the war as a means to take revenge for their economic conditions, and those who wanted to defend freedom of conscience and free public services. The United States and Israel, France and the United Kingdom, Turkey, Qatar and Saudi Arabia who waged the secret war and who lost, did not anticipate this result: to survive, Syria has liberated its energies and regained its freedom. If the Geneva Conference 2 stands, the great powers will decide nothing there. The next government will not be the result of a diplomatic arrangement. The only power of the conference will be to propose a solution which can be applied only after it has been ratified by a popular referendum. This war has bled Syria, half of its cities and infrastructure were destroyed to satisfy the appetites and fantasies of Western and Gulf powers. If something positive emerges from Geneva 2, it will be the financing of the reconstruction by those who have made the country suffer.